Develop routine, accountability and a results driven approach for your team with this book. Does your business run like clockwork? The working day can be busy can’t it? It can be easy to get thrown off course and end the working day asking yourself ‘what happened?’ There is another way; developing productive routines for your business. Every business operates on routines, whether they realise it or not. 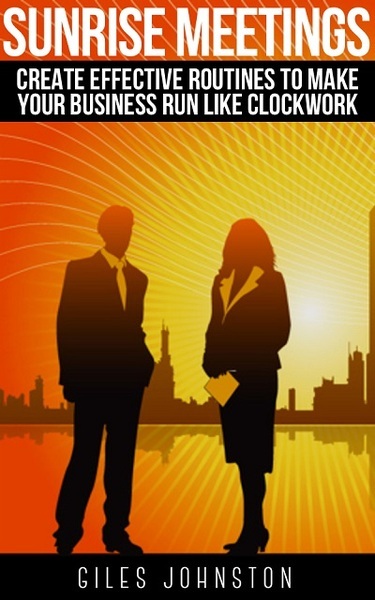 This book can help you to identify your business' routines, so that your business processes can become more effective. What is a Sunrise Meeting? When you define how your business should work (its routines) and distil that thinking into a short meeting you have the basis of a Sunrise Meeting. The Sunrise Meeting helps to re-boot your business each and every day, allowing your team to focus on your business’ objectives. It can help your business to become more process driven, rather than bouncing between chaos and disaster! Do you want greater productivity in your business? More discipline, routine and results. Making consistent progress with continuous improvement projects. This is not a text book. This is a practical guide written by an experienced business improvement expert. The ideas in the book, along with the practical step by step exercise to create your own Sunrise Meeting format, are distilled from real projects. This is a book based on achieving real results in real businesses (of all different shapes and sizes). Business routines quick start template (Microsoft Word / DOCX format). Example Sunrise meeting agenda (Microsoft Word / DOCX format).